West Tisbury School fifth grader Emma Bena was a leader on the plastic bottle ban initiative. 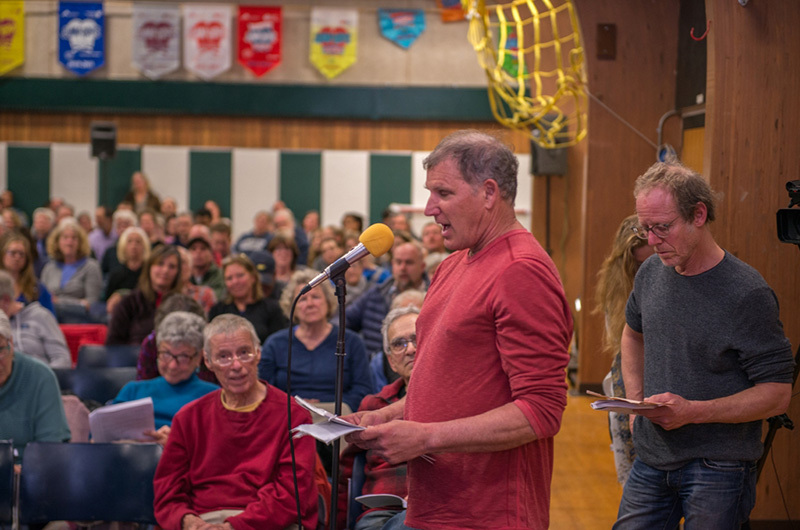 West Tisbury voters agreed to back the controversial housing bank proposal and establish a first-time rooms tax during a two-night annual town meeting this week that saw impassioned debate, procedural tangles and a surprise twist at the end. A crowd of 352 voters packed the West Tisbury School gymnasium Tuesday evening, but turnout was lighter on Wednesday night when 153 voters turned out. Both nights ran late as moderator Dan Waters guided voters through 62 warrant articles, many drawing debate. 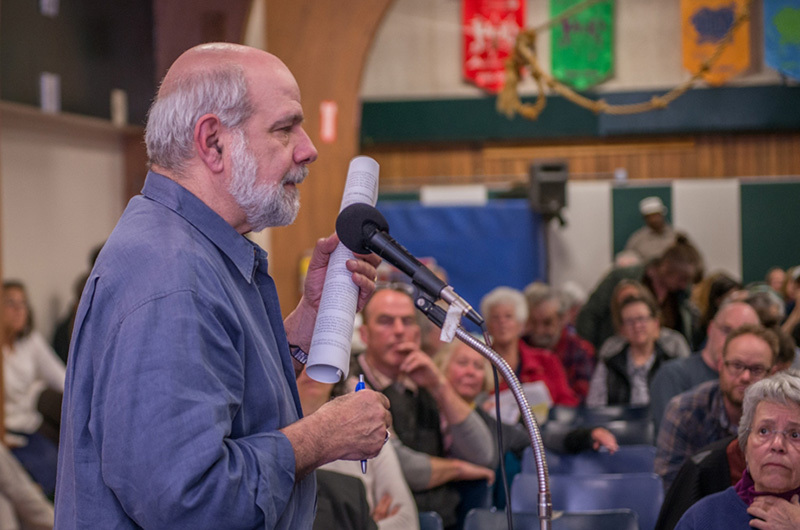 In an unusual turn at end of the second night, a final article to establish a funding mechanism for the housing bank was held over for a special town meeting later this month. Finance committee member Greg Orcutt made the motion to continue the meeting, pointing to the lateness of the hour and low attendance. “The number of people that showed up last night demonstrate the importance of this article to the town. This is barely a quorum and I don’t think it gets a fair airing,” he said. Voters agreed, and the meeting will now reconvene following the special town meeting on April 30. The meeting had been previously set for votes on two high school spending matters. The widely-debated proposal to create a housing bank saw the longest discussion of the two nights, and in the end won approval by a wide margin 184-58. On Tuesday the proposal was defeated in Edgartown and Oak Bluffs. 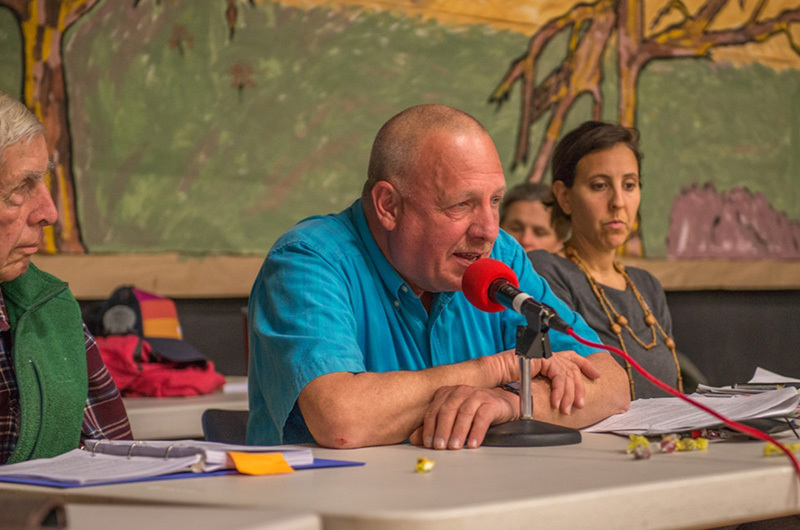 In West Tisbury, Doug Ruskin was an outspoken proponent. He said the timing was right and the need for housing too great to turn down the opportunity. Although he admitted that the proposal still has “holes that need to be filled,” that was no reason to turn it down, he said. Others argued that for all its good intentions, the proposal, a home rule petition that would go to the state legislature, lacks clarity and definition, including how the new housing bank would be structured and staffed. “It’s quite vague as drafted right now,” said attorney Isabelle Lew, who works for town counsel Ronald Rappaport. In the end, West Tisbury became the first town to approve the housing bank. The six per cent rooms tax also won approval, although some who own summer rental properties said adding a tax on top of the new 5.7 per cent short term rental tax could be a big leap for summer visitors. “It’s not coming out of my pocket directly . . . but people may not want to pay 11.75 per cent more so quickly,” said Lisa Amols. Henry Geller, a member of the town affordable housing committee, responded that the rooms tax is already the norm in all the other Island towns and business hasn’t suffered. “I understand being worried about losing the rental but people coming to Martha’s Vineyard on vacation are coming to a relatively expensive place . . . I don’t think it’s that big of a deal,” he said. Voters defeated two related articles seeking to place 60 per cent of the money collected from the rooms tax into stabilization funds for town road work and vehicles. Instead all the money will go into the town’s general fund. At the outset of the meeting a bylaw to ban single-use plastic water bottles begun by a group of school children was quickly and unanimously approved. 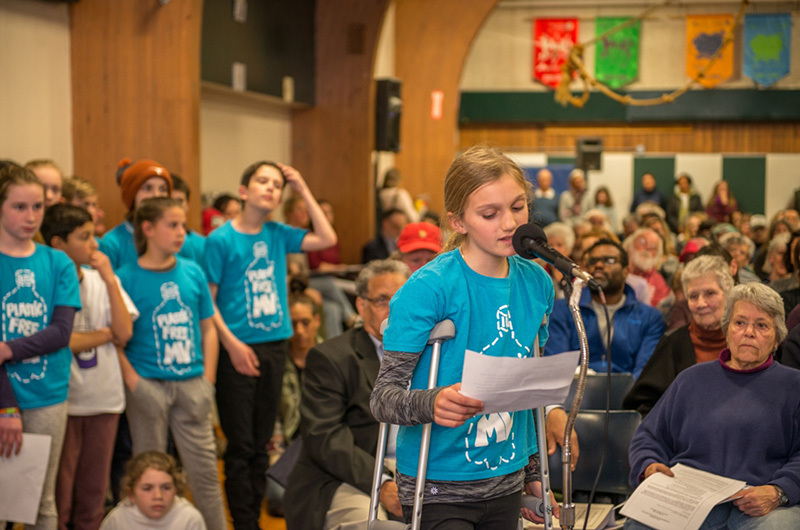 Wearing Plastic Free MV T-shirts, a group of the fifth and sixth graders attended the meeting. “We are hoping to change the habits of not only residents but tourists as well. West Tisbury has the opportunity to be a leader for change. We are looking to you to make a better future for us all,” said Emma Bena, a fifth grader at the West Tisbury School. By contrast, there was little unanimity and considerable confusion over a five per cent fee that the county administrator had tacked onto a $39,000 package of five social service spending articles. County commissioner Leon Brathwaite explained that the fee was necessary to offset the loss of funding when the county stop receiving alarm fees from the sheriff’s office. “We put this together to balance the budget,” Mr. Brathwaite said. Jeffrey (Skipper) Manter 3rd, a town selectman and member of the county advisory board which oversees county finances, argued that the fees were improper and just a hidden way to raise revenue for the county. On both nights he called for amendments for the fees to be removed. “I think it’s inappropriate and misleading,” Mr. Manter said. On the first night Mr. Manter tried unsuccessfully to remove the fee from two line items in the town budget relating to Vineyard Health Care Access and MV Senior Services. On the second night he tried again when the social services articles came up, ands the amendment failed. But a short time later Paddy Moore, a founding member of Healthy Aging, stood to a propose her own amendment to remove the fees for three articles relating to the CORE, First Stop and Healthy Aging programs. Voters agreed. A motion followed to reconsider removing the fees for the previous articles, but failed. A similar scenario played out on the town meeting floor in Tisbury Wednesday night, where there were questions about the fees. West Tisbury voters unanimously approved spending $138,000 for the town’s share of a feasibility study and design work for the high school. Requests totaling $204,000 for school repairs, including $21,000 for work at the Chilmark School and $182,000 for roofing at the West Tisbury School were approved. A bylaw to ban pumping water from town waterways, including the Mill Brook, was adopted by a wide margin. 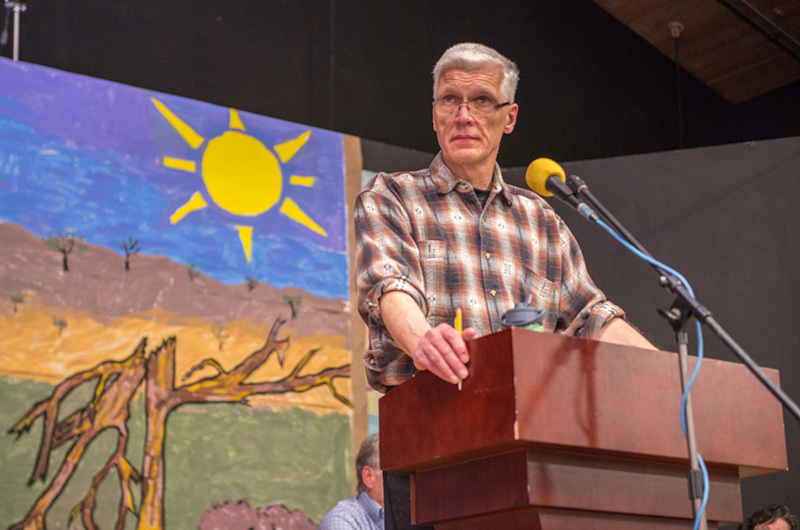 A petition to move future town meetings to Saturday mornings failed after a brief discussion over whether it would improve attendance. Voters approved a zoning bylaw amendment to allow retail sales and cultivation of marijuana at the airport business park, by special permit from the town zoning board of appeals. The article was submitted by petition from Geoff Rose, the owner of Patient Centric of Martha’s Vineyard. • $90,000 to upgrade town hardware including the telephone system in town buildings. On Wednesday the meeting wrapped up just before 10:20 p.m.
Rich people are not the only ones who vacation on MV. Someone mentioned that 5.75% tax added to a short term rental wasn't a big deal. Alone that is true, but combined with the 11% to 15% to 18% commission charged by rental company's, it is indeed a giant leap. That is how most people rent property. Its not just VRBO and AirandB who add these costs, who by the way do nothing but bank a commission. There are many locals, your neighbors, who make their living organizing rentals with hands on care, experience and personal concern. With a $3000.00 a week rental that can add another $600.00 to the total cost. Not all summer vacationers are evil rich bad driving moneyed invaders but people who's families have been coming here for generations, feel a deep connection and love it just as locals do. After the first year, when people get hit with a large uptick in prices, I think you will see drop in visitors in 2020 which will translate into drop in revenue for all the towns. So any gain made with the tax will be a zero sum gain when balanced out with loss of renting vacationers. This could translate into a big loss for people on this island who make a large part of their winter nut on summer visitors. Houses will still be rented out in the summer, just for less time. The 5.75% was already voted by the Legislature, and goes to the State. West Tisbury voted to add 6%, which goes to the Town. Many real estate companies charge 20%. Now with another 11% tacked to that the owner is looking at 31% fees to rent their house. Crazy high number. Some people have to rent their house seasonally to make their bills and keep their homes. I see many more foreclosures on the horizon. This will not stop the winter vacancies of summer homes, just bring less to an already struggling economy. The commission an agency charges is built into the quoted rent, and always has been. The new taxes are in addition to the quoted weekly rent. This town only votes for more taxes and expenditures, never saving. I guess everyone wants a higher tax bill? Very foolish. Not to be too picky, but the State Room Excise is 5.7% not 5.75%. The plastic water bottle bylaw appears to be one of the better ideas of our time. If only our President could lead like the fifth grade students on Martha’s Vineyard. Hopefully more towns see this good student work and stewardship with consideration towards implementing similar actions. Thank you Martha’s Vineyard Public School system for planting the seeds of what could become a wide spread ban. I agree that the additional tax on short-term rentals is foolish. People in Tisbury---those who supported the Housing Bank (also a foolish idea)--- were also crowing that the tax would not be paid by the home owner renting a room but by the tourist, so WHO CARES? The money is coming from THEM!!! Off-island visitors!!! Then in the next breath the same people are lamenting that sooo many poor islanders can't make ends meet and need the community to provide them with a home . . . Disconnect, anyone? Many of the later residents are just earlier versoin of the former residents. That is, the former residents have managed to buy a house int he Island and rent out rooms to make their mortgage. The rental tax is stupid enough on its own, but putting any portion of the money in the Housing Bank is cuckoo. Fortunately Tisbury, OB, and Edgartown have shot this terrible State House-conceived and nurtured idea down. I can't help wondering whether this effort on the Island was some kind of beta testing. So, dunno, maybe West Tisbury, Chilmark, and Aquinnah can fund the whole thing by themselves now?? Or were they perchance counting on the down-Island towns to fund housing in their towns?